We never have much selection when it comes to Halloween themed goodies, mainly it is the same old sweets in different wrappings that get churned out every year, or biscuits with a different filling and spooky packaging. Yesterday we saw Screme Egg Biscuits and today airs slightly on another variation with Cadbury Screme Egg Pots of Joy. Bit of an oxymoron with the name if you ask me but hey ho. 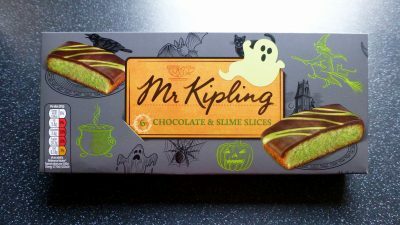 Strictly for the spooky holiday I picked these up in Asda for £1.00 for 4x70g pots. Made with melted Cadbury chocolate, well I sure as hell hope so, Cadbury assures us there’s nothing scary about the taste. 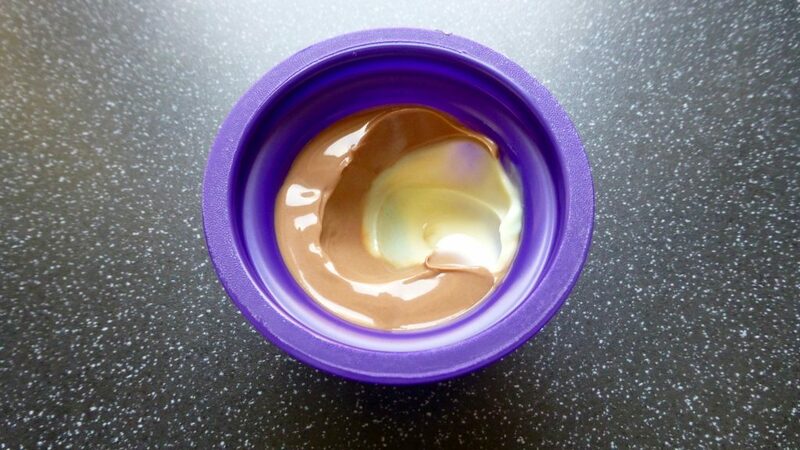 Smooth & Creamy Dessert made with Melted Cadbury Milk Chocolate with a Fondant Layer. Look how glossy and shiny these are, practically see your reflection! The pale green goo is slightly visible and these certainly smelt like a traditional Creme Egg. What was noted was the size of the pots to filling ratio seemed a little off. Why have a pot and not fill it to the top? Seems like a waste! Digging in the dessert was pretty thick and held its own. The green colour was pretty lost and was more white like you would see in the centre of a Creme Egg. 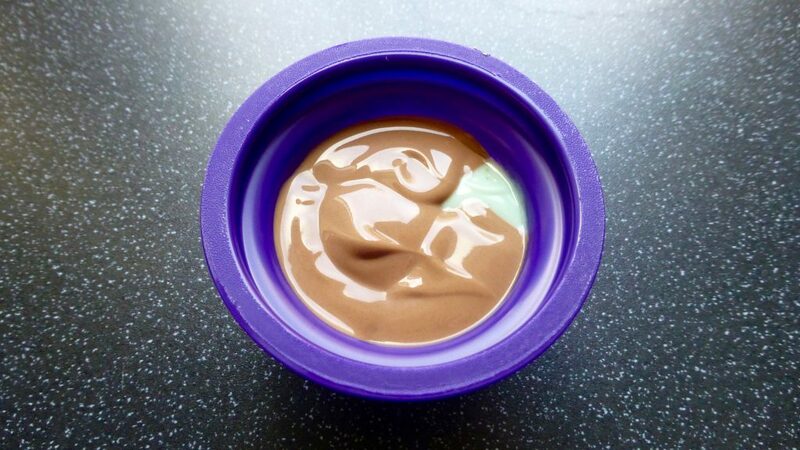 The chocolate element actually tasted pretty darn delicious and was how I remember Cadbury’s Dairy Milk being. The white and green goo was super sweet, little grainy but absolutely nailed the centre of a Creme Egg. Together with the chocolate it was a no brainer – a blooming scrummy pot. 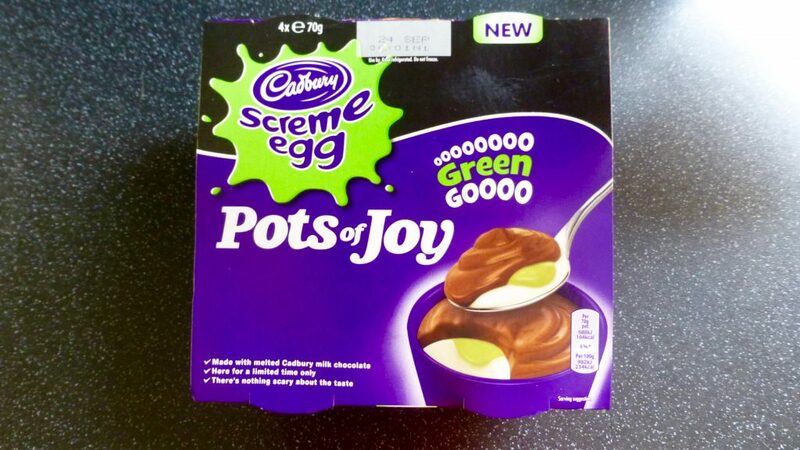 There is nothing to fear here with the Cadbury Screme Egg Pots of Joy because they are delicious. 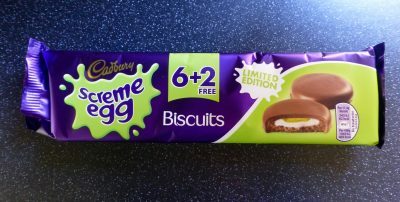 Thank the lord these were better than yesterdays stale Cadbury Screme Egg Biscuits! For those like me who are in the camp of what the hell have Cadbury’s done to our normal Creme Eggs, should give these a go because they really do taste delicious. See you tomorrow for another Monster Munchies review…. I LOVE these. Their looks are disappointing but their taste makes up for it. I could happily destroy a pot right now haha.